Although the majority of New York City’s wealthy gentry crowded into the grand Episcopal Churches in the 19th Century, the Reformed Church was the first organized church in Manhattan, in existence since 1628. While Vanderbilts and Astors worshipped at St. Thomas Church or Trinity Chapel, Van Rensselaers and Rollins attended Marble Collegiate Reformed Church on Fifth Avenue. Among that congregation were Percy R. Pyne and his wife Albertina Shelton Pyne. The president of City Bank, Pyne amassed a fortune of over $10 million. Around the time of the Civil War he built a broad, 5-story townhouse with sweeping entrance stairs at No. 25 East 22nd Street off Fifth Avenue in the fashionable Murray Hill neighborhood. Here, in their home filled with their collection of paintings and the finest of furnishings, the Pyne's entertained the cream of society. In the 1892 the Pynes moved north, having built a grand new home in Riverdale. At the same time the Reformed Church was seeking a consolidated headquarters for its administrative work. The Church purchased the mansion for $67,000 and immediately began renovations. An large assembly room was added to the original structure, “furnished through the liberality of a few laymen.” One room was delegated to the Board of Foreign Missions, in which were displayed “many interesting objects collected by the Church’s missionaries in heathen lands.” Two rooms were used by the Board of Direction, and others were renovated for the Board of Publication, the Women’s Executive Committee, the Board of Domestic Missions, The Board of Education and the Women’s Board of Foreign Missions. The atmosphere of the elegant home went from glittering dinner parties to sometimes surprising church functions. In January of 1897 a Secretary of the Japanese Legation at St. Petersburg, Mr. Akiyama, paused at the Sturtevant House Hotel on his way back to Japan. In his room was a Bible. The Secretary read the text, and immediately decided to convert from Shintoism to Christianity. Within the day the Japanese diplomat was taken to No. 25 East 22nd Street where he attended a session of the Women’s Board of Foreign Missions and was baptized by Reverend Clark. On July 8, 1939 the Reformed Church headquarters moved to 156 Fifth Avenue. Two years later fire tore through the former Pyne House, seriously damaging the interiors. In 1942 the Serbian Orthodox Church purchased the property with the intention of converting it into a church. Those plans were abandoned when the Church obtained the former Trinity Chapel and the house was sold again a few months after it was purchased. As the East 22nd Street neighborhood changed, the house became home to fashion companies. For years in the late 20th Century No. 25 West 22nd housed the New York City headquarters of Nike, Inc. 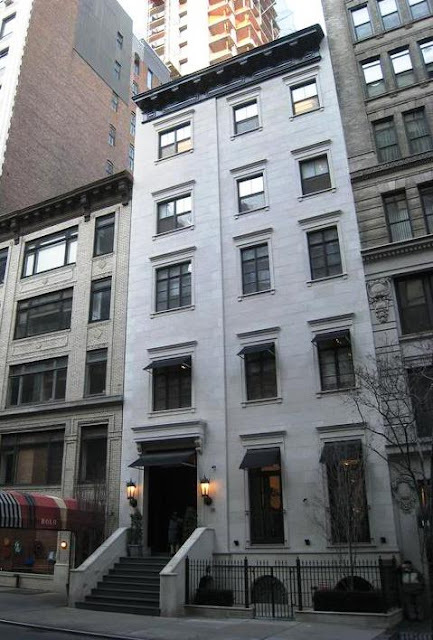 In 1997 it was sold for $1 million to Novello, Inc., a fashion company, that intended “to use the property as its New York headquarters” and showrooms. One of the last surviving reminders of the elegant residential period of East 22nd Street, the exterior of the Pyne House is amazingly intact despite the substantial alterations inside. 25 East 22nd Street also served as the Arthur M. Lamport House, of the City College of New York's House Plan Association, when it opened on May 25, 1944. I am not sure exactly when the house was sold. More information can be found at the City College of New York Archives and Special Collections (archives@ccny.cuny.edu; 212-650-7609).